Spend time going over your seed catalogues and plan your garden. Think about new seeds that you would like to try and foster for the plant sale. Plant trees, shrubs and vines as long as the ground isn’t frozen. Apply dormant spray to fruit trees when you anticipate 24 hours of dry weather. Make sure that any leaves or broken branches are off the lawn. Prune out any broken or damaged branches. Check your houseplants: divide and re-pot any pot-bound plants. Prune judiciously to create a compact, attractive specimen. Succulents – jade, hoya, sansevieria—may be reluctant to bloom in the house. Grow them in a small pot and hold back the water. This may persuade them to flower. Start a Garden Record Chart now allowing space to record the dates of First Frost; Last Frost; Sowing Seeds; Planting;Transplanting; Time of Bloom; First Fruits; Problems with pests, and Other Information. Make a careful study this month of three important garden subjects: fertilizers, spraying and best seed varieties. Lift and divide perennials as long as ground isn’t frozen. In case of a late cold spell watch that your pots don’t freeze and then collect water on top. Remove any irrigation posts in your pots if a big freeze is coming. Start seeds of Statice, Dusty Miller, Pinks, Ornamental Peppers, Lobelia, Geranium, Gerbera, Heliotrope, & Petunia etc. Increase light and water to geraniums and fuchsias that were brought indoors and went dormant. Start seeds of lettuce, spinach, radishes and corn in cold frames. Bring in potted bulbs of hyacinths, tulips and daffodils for a splash of early spring colour. Prune back miscanthus and pennisetum grasses to about 1 foot from the base. Prune winter flowering shrubs and vines right after flowering. Prune roses when forsythia is blooming. Apply dormant spray to fruit trees, roses and deciduous shrubs and trees. Plant new trees and shrubs as long as the ground isn’t frozen. Watch out for aphids. If you find any either squish them or spray with Safers soap. Keep an eye out for any weeds that are starting to grow. If you pull them now while it is still easy to do so you will have much less of a problem this summer. Prune winter-flowering vines and shrubs after blooming. Plant summer and fall blooming bulbs. Plant ground covers, grasses, roses, fruit trees, perennials, shrubs, trees and vines. Start feeding your houseplants with an organic fertilizer. Start feeding your trees, shrubs, perennials and vines with an organic fertilizer. Prepare vegetable beds by working in plenty of compost or manure. Lime two weeks later if needed. Continue to clear and weed flower beds and mulch with well-rotted compost or manure. Continue to lift and divide perennials. Prune forsythia and grey-leafed plants like lavender, lavender-cotton and senecio. Prune roses and apply organic rose food to soil. Sow radish, garlic and broad beans when it gets warmer. March 16-31 (or when it gets warmer) begin successive sowings of peas, spinach, leaf lettuce, Chinese vegetables, onion sets, turnips and shallots. Plant new strawberry plants and feed established plants. Feed rhubarb with rich organic material. Sow seeds of annual herbs and prune established herbs such as sage, rue and thyme if they have become leggy. Stake perennials that need it and mulch perennials if not already done. Rose pruning should be completed by now. Mulch with manure or well-rotted compost. Shear winter-flowering heathers after flowering. Continue planting trees and shrubs. Check vines growing on the house to make sure they are not invading window frames or working their way under gutters and shingles. April 1-15, plant early potatoes, green onion, bulb onion, kohlrabi, cabbage and leeks. April 16-30, sow beets, carrots, Swiss chard, broccoli, cauliflower, parsnip, kale and lettuce. Sow zucchini, cucumbers and tomatoes in a sunny window or cold frame. Start planting water plants in pool. Layer your veggie waste with carbon (dried leaves, shredded newspaper), and a shovelful of soil. To speed things up , add some fresh manure or compost accelerator such as “Rot-It”. Give all your plants, and especially veggies, a drink of compost tea. Fill a pair of pantyhose, porous old socks, or a heavy cheesecloth bag with well-rotted compost or manure. Hang in a bucket filled with water. Steep for a couple of days until the colour of weak tea. Dilute with water if necessary. Start cucumbers, winter squash, melons indoors or in the greenhouse. Transplant before the third “true” leaf matures – three to four weeks after planting indoors. Wait until the temperature is above 50° F (10° C) or even longer to put out tomatoes. Direct seed outdoors: broccoli, corn, parsley, turnips, arugula, carrots, cilantro, kale/collards, kohlrabi, scallions, spinach (bolt and heat-resistant varieties), Swiss chard, beets. When soil has warmed thoroughly direct sow bush/pole beans, zucchini/summer squash, and pumpkins. Check out West Coast Seeds for more seed to plant in May. Direct sow hardy annuals at the beginning of this month. Plant patio containers. Most flowers only require 15–20 cm (6–8 in.) of soil at the most. Fill the bottom with anything that will fill the space such as dried leaves, pop cans, pots. Prune back spring-flowering perennials to encourage vigour; plants may bloom a second time. Remove spent flowers of tulips, daffodils, other bulbs, but be sure to leave the foliage untouched. At the end of June sow “starts” for some overwintering veggies like purple sprouting broccoli and big winter cabbage. Sow a few seeds per 4-inch (10-cm) pot in good loose starter mix. Protect from marauding slugs, grow on in dappled light, plugging into spots vacated by squash, tomatoes, beans, etc. in early fall. Basil may be seeded outdoors now. Don’t allow plants to flower and go to seed—keep the tops pinched off. Continue planting bedding plants. Feed regularly with organic fertilizer and water well. Plant seeds between patio stones to out-compete weeds. Try California poppy, Roman chamomile, creeping thyme and, in shadier spots, lobelia. 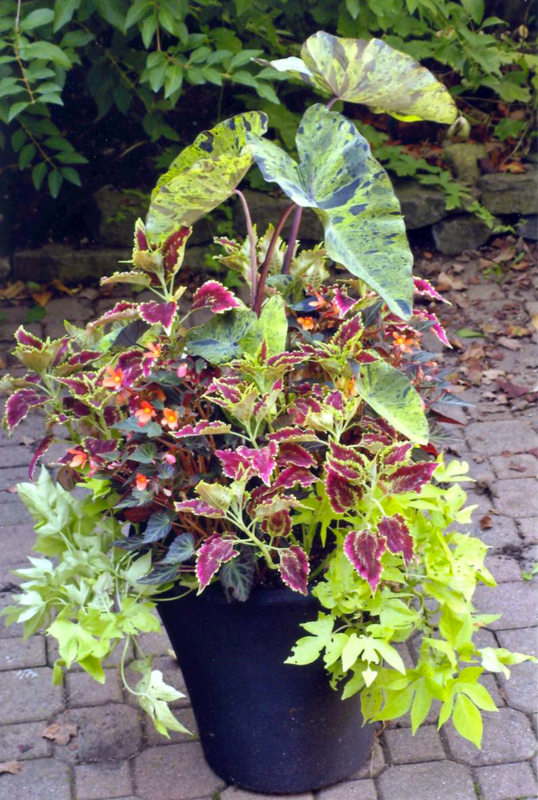 To have color from late summer to fall, plant begonias, impatiens, salvia, marigolds, verbena, and zinnias. For permanent plantings, try perennials such as bearded iris, lavender, coreopsis, statice, gazanias, and gloriosa daisies. Plant trees at least 6 feet (2 m) away from sidewalks and concrete pools, so growing roots do not crack the concrete. Divide and transplant bearded iris using the vigorous ends of the rhizomes. Discard the old center portion. Cut the leaves back to about 8 inches (20 cm). Feed roses after each bloom cycle, water regularly, and remove spent flowers. If you plan to do some landscape planting this fall, now is a good time to decide on the plants to use and how to arrange them. Order your spring - flowering bul bs now. A good guideline to use is 'biggest is best' in regard to bulb size. Be careful about so - called "bargain" bulbs as they may be small or of inferior quality. By the time the seed catal ogs arrive in January, you may have only a vague idea of what this year's garden was like. Make notes now so you can have a better garden next year. Sow seeds of cool weather crops such as carrots, parsley, radishes, Swiss chard, lettuce, and beets Sow perennial seeds: Shasta daisy, coreopsis, colum bines and black - eyed Susan. Fall vegetables can be planted now. You can also start to plant seedlings of cabbage, cauliflower, broccoli, Brussels sprouts. Late - blooming perennials, such as Helianthus, Helenium, Heliopsis, and Rudbeckia, make great color di splays in the fall landscape. Plant autumn - flowering crocus, sternbergia, colchicum, and other fall - flowering bulbs as soon as they become available at garden centers. Crocus and sternbergia need full sun; colchicum can be planted in areas receiving light shade. Prune cane fruits such as raspberries and blackberries (except everbearing raspberries). Plant winter pansies and fall annuals (calendula, dianthus, ornamental cabbage and kale). Divide peonies. Be sure to have 3-5 eyes per division. Plant with eyes no deeper than 2” below soil. Divide bearded iris and perennials and plant new ones. Plant herbs and ground covers as the weather cools. Replace spent annuals with winter pansies, winter kale and/or grasses. Prepare soil for autumn planting. Dig and store tender bulbs like Dahlias and Cannas. Rake and remove fallen leaves. Fertilize trees, shrubs and perennials one last time as this will produce stronger plants. Divide and transplant perennials and ground covers. Pot some for the May plant sale. Plant bare-root trees, shrubs, ground covers and vines. There is still time to plant those trees, shrubs and perennials you picked up in October but haven’t had time to get in the ground. Just remember to mulch them well once they are planted. This is also an excellent time to move or divide peonies. Get those bulbs in. While you can wait until December if you must, your bulbs will do much better if you can get them in before then. Don’t forget to add a little organic Bone Meal with each bulb. If you haven’t already done so, apply a good organic lawn fertilizer such as Gaia Green Turf & Lawn Blend. You can also fertilize your trees and shrubs once the leaves have turned colour and/or fallen off. Water all your evergreen trees and shrubs really well before the first hard frost. This may seem like a moot point with all the rain we get but even a few days without rain will dry out your evergreens and can lead to ‘winter burn’ or even death. If you saved your amaryllis bulb from last year now is the time to bring it in, re-pot it, water it well and place in a bright room. You should have wonderful blooms by Christmas. Stop fertilizing your indoor plants since they use less water and fertilizer due to the lower light levels. Delay all unnecessary pruning until late winter or early spring, just before bud break. Rake up those leaves. Leaving them on the lawn can prove detrimental to it. For a great mulch for your garden run over them with the mower first then spread them over your garden beds. Now is a good time to clean, repair and sharpen all your gardening tools. If looked after properly you will get years of use out of them. Hanging baskets should be emptied and washed thoroughly with soap and mild bleach solution before being put away for the winter.